This DCH ad, on a public transit platform, seeks to turn riders into drivers. DCH Auto Group, one of the nation's largest auto retailers, has launched its first advertising campaign promoting its corporate brand. The multimedia pitch invites potential customers to "test drive" the DCH dealerships. DCH has 27 locations in California, Connecticut, New Jersey and New York and an estimated $1.6 billion in annual revenues. The campaign was launched in November and promotes "unparalleled customer service." "People don't always see auto dealers in a positive light, and we want to change that," says Susan Scarola, DCH's CEO, who declined to disclose her advertising budget. The South Amboy, N.J., group spent four years developing operating standards to elevate how customers view DCH. It has trained its 2,100 employees in those operating standards. The standards include presenting finance terms and aftermarket insurance products such as extended service plans in an easy-to-understand menu. The staff also works as a team to familiarize customers with their vehicles at delivery. 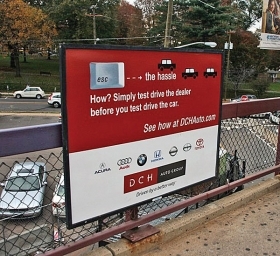 In the East, DCH is touting the "test drive the dealer" message using billboards, train station and bus posters, and radio. In California, the dealership group is using radio, cable TV and Internet advertising. All ads direct people to DCH's newly redesigned corporate Web site, so the company can measure the campaign's impact with hits and click-throughs. "Our manufacturers focus on advertising their products," Scarola says. "We're advertising the customer experience we provide on behalf of the manufacturer."